Well, today's the day of our Climate Emergency Countdown conference in Toronto. But you, dear reader, are getting the scoop right here. Start now. Encourage all ENGOs (as well as human rights, development, and public health NGOs) to mount a massive education / agitation campaign. Educate about RCP2.6 and CAN International’s position statement (see below). Help everyone in the world understand the climate emergency and that there are simple yet powerful solutions (see below). And then encourage everyone to apply pressure to their own governments. Get everyone calling for an emergency zero-carbon global agreement in Paris (see below). New York is the place to be this September. In every way possible, let's urge attendees at the NYC September 20-21, 2014 People's Climate March to call for a DECLARATION that CLIMATE CHANGE is an EMERGENCY. And in every way we can think of, let's urge all government representatives and negotiators at UN Secretary-General Ban Ki-moon's Climate Summit 2014: Catalyzing Action to declare the emergency. Once governments declare that we are “beyond dangerous anthropogenic interference with the climate system” (UN Framework Convention on Climate Change), things will start to happen. This declaration would be an automatic trigger for the bureaucrats who work underneath politicians and within governments to start working on climate change solutions. Scientists say that determining whether climate change is an emergency is a value judgement that society must make. So let's make it! We're society. Let's get the CLIMATE EMERGENCY DECLARED! Governments "give" $1.9 trillion every year in direct and indirect subsidies to fossil fuel corporations. Direct subsidies must be switched to perpetual energy technologies. Period. Especially in developing nations to help them "leapfrog" over fossil fuel dependence. We also need to demand an economic shift that will make fossil fuel companies pay for their $1.4 trillion every year in economic externalities (indirect subsidies or "mispricing"). We need to charge a FEE on CARBON EMISSIONS to pay for their health and environmental costs and to help offset the transition to the Solar Age. This "price" on carbon can be applied to promoting the use of safer, cleaner, healthier, more equitable and more peaceful perpetual energy technologies ("perpetual" means renewable without biomass burning technologies, since burning emits carbon). This carbon fee will signal the market overnight, and investments will be switched to renewables. Post Paris, we need to immediately begin a rapid decline in greenhouse gas emissions. And then we need to continue that decline for decades, until we reach zero carbon emissions by 2050 … and safeguard the future. Don't you just love an epiphany? I had one the other day while sitting in a coffee shop waiting for my sister, the day before her wedding. An epiphany, in the sense I'm using it, is a moment of sudden revelation or insight. This time, it was a discernment that I've struggled with for years that finally -- in a flash! -- became quite clear to me. 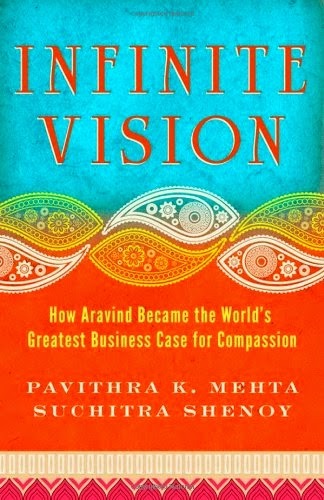 I was sipping on something hot, reading Infinite Vision: How Aravind Became the World's Greatest Business Case for Compassion. I'm reading it because I've volunteered (as a curriculum developer) at Aravind, the biggest and busiest eye hospital in the world, five times. I know one of the authors (who was just a young teen when I first visited Madurai in Tamil Nadu, India in 1994), and the whole Aravind "family" has stayed in my heart over the last 20 years. I've known all this time that the hospital's patriarch, affectionately known as Dr. V (because his name is nine syllables long), was a devotee of Sri Aurobindo (the hospital was named in his honour, as was Auroville near Pondicherry) and the Mother, but besides finding out that Aurobindo's writings were rather too dense for me (the man was a genius, literary and otherwise), I never bothered to pursue Dr. V's attraction to these writings. Thanks to this book, I've finally learned about Sri Aurobindo's gift. On inner values hangs the outer plan. His small beginnings asked for a mighty end. "'Man is a transitional being,' [Sri Aurobindo] would declare, 'he is not final.' A conviction that evolution is incomplete, that humankind as we know it is a work in progress and that it is destined to realize a collective and radical transformation of consciousness, is central to the approach Sri Aurobindo developed and termed 'Integral Yoga.'" "Sri Aurobindo's philosophy differs from most traditional Eastern belief systems in two ways. First, awakening, or enlightenment, is not the end goal. Sri Aurobindo was pioneering the idea that humans have the capacity to shape their lives in harmony with the deeper forces at play, and that by doing so, they actively help all of creation make an evolutionary leap to its summit potential. Second, he did not advocate retreat from worldly activity and renunciation of material concerns in pursuit of realization. He defended life on earth as the real field of growth and progress. His Integral Yoga proposed a sweeping canvas that included all spheres of the human experience: mental, physical, emotional, and spiritual." BINGO! That's it! "He defended life on earth (Earth?) as the real field of growth and progress." For many, many years, I have resisted spiritual work (though, ironically, I think of myself as a spiritual person). I've witnessed too many friends who were on a spiritual path focusing inwardly at a time when there's so much to be done in the outer world. I couldn't bring myself to focus on myself. But between Sri Aurobindo's call to apply spiritual growth in the physical world and Dr. V's example of applying his deep spiritual work to the purpose of ending needless blindness in India and around the world, I felt an instant liberation -- a new freedom to do the climate change work in a spiritual way. "Sri Aurobindo and the Mother did not codify a set of techniques in their teachings. Maintaining that the path to transformation is specific to each person, they instead emphasized an ecumenical approach comprising skillful aspiration, rejection, and surrender as means to progress. In this trifold framework, aspiration is defined as a sincere dedication toward realizing truth and perfection in all aspects of living. Rejection is the diligent refutation of hindrances -- any movements of thought or action that cloud the consciousness and impede an alignment with truth. And surrender is the deep, unconditional opening to the influence and will of our highest nature." Theirs was "the secular idea of working to be an instrument of emerging perfection within the field of daily living." And then came this inspiration from the life of Dr. V. "The more one examines Dr. V's life, the clearer it becomes that what set him above others was not broad strokes of genius or recurrent flashes of brilliance. His accomplishments were made up of a steady succession of disciplined moments accumulated over a lifetime -- moments inhabited by empathy, a passion for excellence, and the stamina for hard, humble work." Perhaps it's because I want us to emulate Dr. V's reach and influence in eye care and blindness eradication within the world of climate change activism? Or is it simply so that you, long-time reader or first-time visitor, can bear witness to this luminous epiphany in my life? Whichever, I'm excited to have found an authentic intersection between fighting the good climate change fight and doing the good spiritual work. According to Sri Aurobindo, "our ascent to the top of the evolutionary staircase" is an inevitable journey that we do not take alone but with every other species, "because it is both 'the intention of the inner spirit and the logic of nature's process.' In other words, it is a journey that is being worked out by our own deepest purpose, in conjunction with the natural unfolding of the universe." Indeed, Aurobindo believed there is a "concealed consciousness" in all things: "Everything contains a seed of a higher, cosmic intelligence … the Divine." Acknowledging both the Divine and the Ecological Imperative in all life can only help us in our mental, physical, emotional and spiritual work to safeguard this precious planet. As Dr. V concluded, "Humanitarian service [and climate change work is humanitarian work!] is quite difficult if you are not able to love with your whole heart. Love is the most important factor to disseminate anything...."
With thanks to Pavithra and Suchitra (the book is a lovely, lovely read), Dr. V, Sri Aurobindo and my sister (for making me wait in that quiet coffee shop ;-) for this timely inspiration. 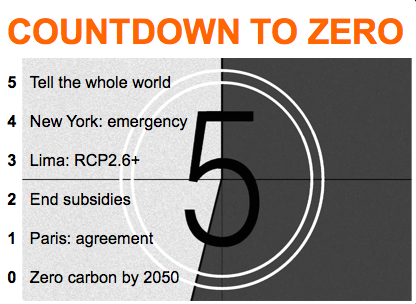 Next week, I will lay out our Climate Emergency Countdown plan for you! Hope you have a fabulous week! 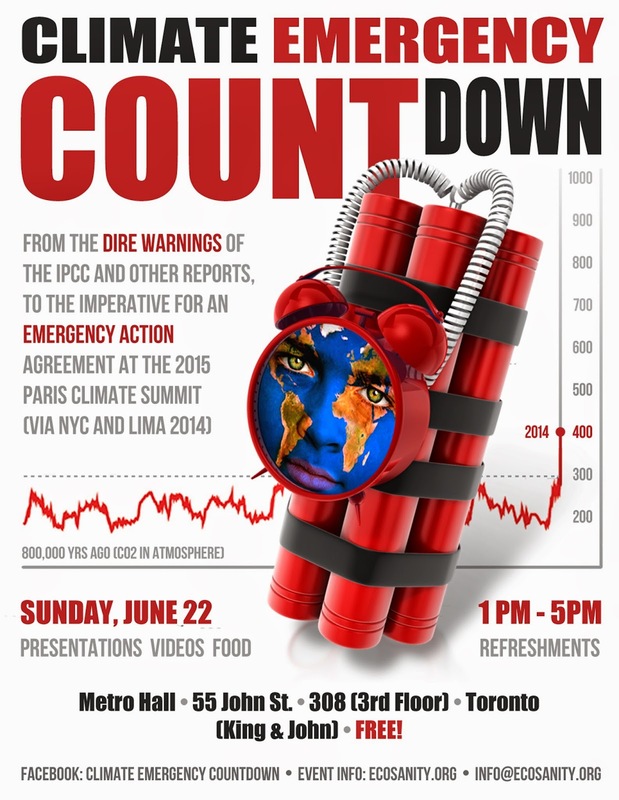 If you're in or near Toronto on 22 June 2014, please come meet us at the Climate Emergency Countdown event. See details on the poster below. EMERGENCY international action must be taken FAST because, on our current, "business as usual" trajectory, catastrophic, irreversible, runaway threats to civilization, humanity and most life are projected to ensue over the next few decades, and there is a high risk that we could become committed / locked in to some over the next few years. To help catalyze momentum and pressure action, UN Secretary-General Ban Ki-moon has called a momentous climate summit in New York City this September 23rd. Civil society groups plan to organize a massive turnout in the tens of thousands (on September 20th). This will be followed by the crucial annual international Climate Change Conference (COP20) in Lima, Peru, from December 1-12 of THIS YEAR, at which all the key parameters must be determined for there to be any hope of a signed 2015 agreement in Paris. So it's New York to Lima to Paris, or bust! 1) To launch an action alert communication initiative to pressure all participants in the UN COP (Conference of the Parties) negotiation process to sign an EMERGENCY agreement at Paris 2015 that is consistent with both the stated agenda of the UNFCCC secretariat AND the most aggressive IPCC scenario (RCP2.6), which require global heat-trapping greenhouse gas emissions to peak AND fall fast from 2020 [reaching virtually zero carbon -- NOT "net zero," as you might start hearing -- by 2070 or so]. 2) To outline the true extent and negligence of continued direct and indirect subsidies to fossil fuel corporations ($1.9 trillion per year), to explain the necessity for the rapid phase out of subsidies, and to call / build support for their reallocation in order to speed up our transition to perpetual (non-burning renewable) "zero carbon" energy sources (such as wind, solar, geothermal, tidal, wave, micro-hydro). 4) To communicate the importance of the next 18 months, with particular emphasis on the next 6 months, when so much of the eventual outcome of international negotiations will be determined. I read a sad article this past week (which, when juxtaposed with idiot deniers still insisting that nothing's happening and it's all a hoax, made me cry) about what's happening to the small island nations in the Pacific. People in island-based countries and communities that are, literally, disappearing (you've heard me talk about those who are "losing their homes and entire homelands") have started wondering what they've done to deserve this. An alarmed Wayne Andrew is the head of a reef protection organization in Palau. According to him, "Local people wonder what they've done wrong and 'why they have to pay the ultimate price when other nations are benefiting from all this,' referring to wealthy nations' high CO2 emissions." Hearing that breaks my heart. According to Tony de Brum, Foreign Minister of the Marshall Islands, "'There is no sense of urgency. It's frustrating' .... Countries with the biggest CO2 emissions are more concerned about their economies than the survival of small island nations," he suggested. de Brum offered an evocative analogy: "'By the time the rest of the world awakes to [the] crisis, we've drowned,' he said. 'We are like cockroaches trying to herd elephants.'" That reminded me of this African proverb: "If you don't think you can make a difference, if you don't think you have power, if you think your voice is too small to be heard, then you've never been in a tent with a mosquito." 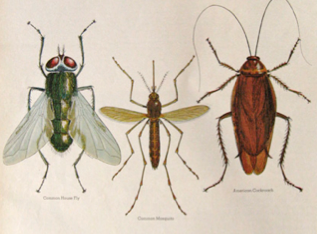 I've also heard that mosquitoes can force migrations of large animals, such as the caribou herds of Alaska. Add to that this statistic I just heard: on average, you have to talk to someone seven times before they will buy what you're selling. Can we give world leaders and climate conference negotiators credit for being as wise and intelligent as elephants? Probably not. But if we make pests of ourselves, like cockroaches and mosquitoes do, perhaps they will do the right thing in New York (September 2014), Lima (December 2014) and Paris (end of 2015) -- just to shut us up and get rid of us. So folks, it's a call to wings (rather than arms)! Start buzzin' around their ears (and walkin' up their walls) and maybe they'll start listening. Here's to a climate change agreement that saves the world from us. From New York and Lima to Paris, or bust -- for the sake of all the children, of all species, and all future generations, for all time.